2007 Triumph Bonneville Black. Picture credits - Triumph. Submit more pictures. A true roadster in every sense of the word, the Bonneville matches classic British style to 21st century technology. 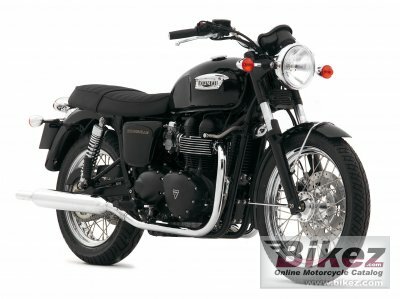 Modifications compared to previous model: For 2007 the Bonneville has an increased engine size of 865cc. This latest model also comes with a black engine and polished, lacquered engine covers and a span adjustment clutch lever. Ask questions Join the 07 Triumph Bonneville Black discussion group or the general Triumph discussion group. Bikez has discussion forums for every bike. View comments, questions and answers at the 2007 Triumph Bonneville Black discussion group. You can sign up for e-mail notifications when other riders answer you. If you have extensive experience with the MC, please send us a review. If you consider buying this bike, you should view the list of related motorbikes Look at photos. Compare technical specs. And check out the rating of the bike's engine performance, reliability, repair costs, etc. You can compare the rating with other bikes.